I'm really feeling this '70's working woman look. Nice job, Gap (blouse, $44.50 and pants, $49.50). 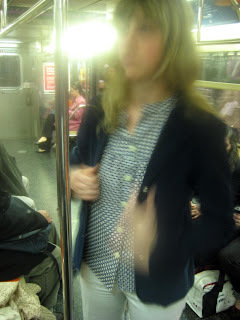 And Erica, as usual, puts it together great: the print shirt, the schoolboy blazer, and the patent pumps is all perfection. 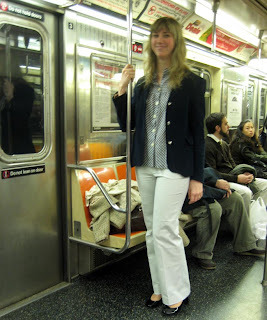 And the soft, winter white pants look so January modern, it's refreshing. Why else should we shop Gap in the new year? It's all about the size. At Gap 6 is a 6, not an 8 or 10. Get a further jump on the upcoming '70's trend with this Bitten jean vest, right, at Steve and Barry's. 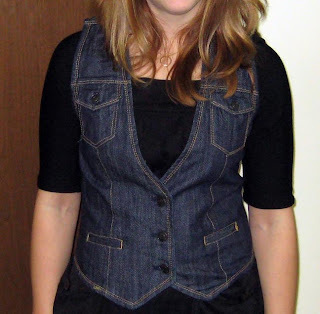 What's hipper than a denim vest, man? This is $14.98 and fits pretty well. The color is perfect for the retro feel. It's very Sears Toughskins. Steve & Barry's, Manhattan Mall level 2, 33rd and 6th Ave.